These videos were on our main blog page when first posted. We've created this page for easier reference when looking for a nail art ideas. Enjoy! Get all of your nail care products - Shop Now! Article: Keeping your nails healthy. Article: Little Secrets for polishing your nails. Article: Strengthening brittle, constantly breaking nails. Enjoy these fun summer festive nails! Nail Art you can do yourself! Try these gorgeous nails. You will need three nail lacquer colors. In this example, we used a light blue, dark blue and a pink. You will also need a fan brush. Start with a base coat of your lightest shade and let dry. 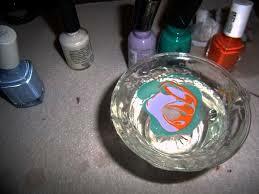 Next, drip your fan brush tips in your second color a gently brush across the nail. Spring is in the air so let those flowers bloom! Black & Gold and Oh So Chic! Gorgeously simple or dramatically fun, Essie shows you how to do Fall Diagonal Dry Brush Nail Art. They've chosen a dramatic background with soft dry brush highlights, but let your imagination take flight if you dare! The technique is the same no matter what three colors you choose! "Tide-dyed" nail art is just a perfect summery look. Essie Nail Polish shows you how. Chevron design is easy to do. Be imaginative with your color choices to create a totally you and unique look! This video will give you a great technique for using lots of great colors all at once. Totally fun! Picnic in the park or champagne brunch? classy is your middle name in this matte metallic nail art design by Essie. step 2: clean then prep nails with an essie base coat. step 3: apply 2 coats of lilacism. let dry. step 4: apply 1 coat of matte about you. let dry. step 5: using a toothpick, bobby pin, or dotting tool dipped in nothing else metals, add dots in an asymmetrical pattern. let dry. Spring Speckle by Essie! These fun nails are so easy! We picked this video because it shows you a perfect technique you can use yourself - not only for Spring, but for any season. Just vary the colors. You can get all of the Essie colors shown in this video Beauty Care Choices - Shop Now! P.S. the "Fill the Gap" treatment referred to in the video is great for those with aging nails. It hydrates the nail as it fills in deep, unsightly ridges making your polish go on much more smoothly and your manicure perfect! Thanks for the how to videos i love the ideas, much better than plain old nails ! These videos sure help me! Very cool nail videos, Thank you so much!! This is awesome! I will send the link to my sister. She's really into nail art. My neighbor is NUTS about her nails! Fingers and toes alike! Sending this to her, she'll be VERY interested, thanks! Woo hoo! These are great videos. I'm not very creative, but these were easy to follow. These are some cute designs. I like the dot ones. These are really very pretty and you make it look so easy. I would probably mess them up. Oooo, I want to try that tide dyed trick! I like the different designs on the different nails in the videos. 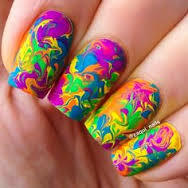 I wish I could do this type of nail art! The videos are great.